I just want to use this opportunity to thank God for opportunities that have come my way through my blog. When I started blogging, it was strictly to allow my friends and family to follow me along on my NYSC year. If you've never read that blog, The Ajebutter's Guide to NYSC was a funny and real look into my experiences so definitely check it out. I found my love for blogging there and I can remember starting this blog. When I would get more than 50 views a day I was ecstatic! I just wanted to share my life in a real, authentic, and often times funny way. Today I'm getting close to 1 million views total and the amount of opportunities that have come to me, and even Cakes, via the blog has been amazing. I can't thank God enough for His blessings and those he has used. 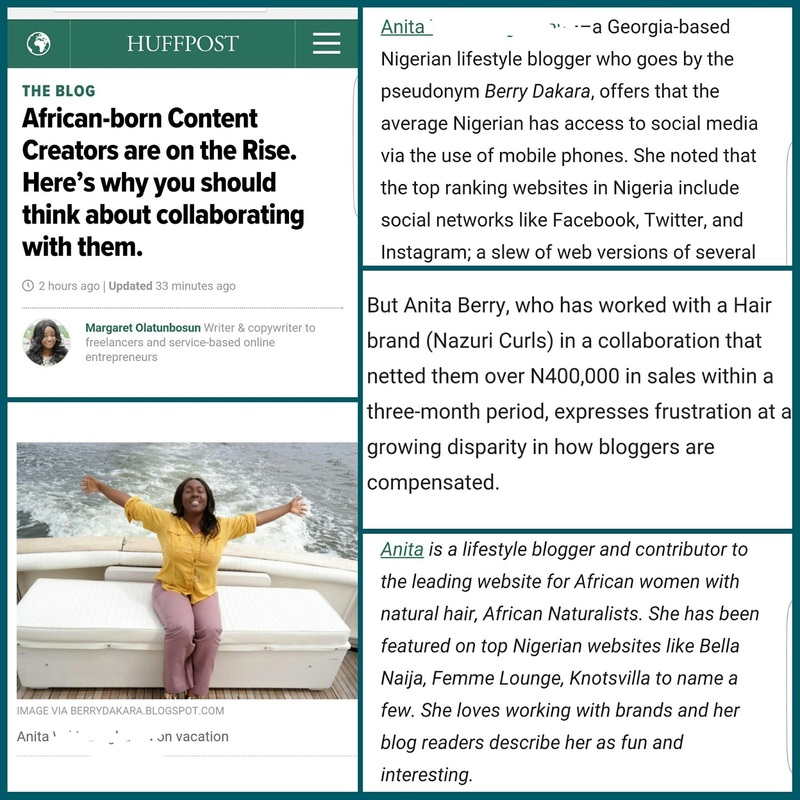 I mentioned this across my social media over the weekend - I was quoted in a Huffington Post article about how Nigerian Content Creators are on the rise. When the call came for input, I volunteered myself and then got scared. But I fought through my fear and nerves and sent out my contribution. Thanks to Margaret for the article and my fellow Nigerian bloggers mentioned as well. Additionally, a couple of weeks ago I got an email claiming to be from Maggi Nigeria. They are celebrating 50 years and they wanted to send me a package as one of their picks of the Top 50 influencers of Nigerian culture and economy. Me ke?! Like how?! I won't even lie, it took me almost a week to respond because I didn't know if what I saw in my email was real. I thought maybe one scammer was trying to flatter me in a bid to get my trust and address. I showed about 4 people the email to get their thoughts about it. But then, I replied their email and they were very polite and answered my questions. 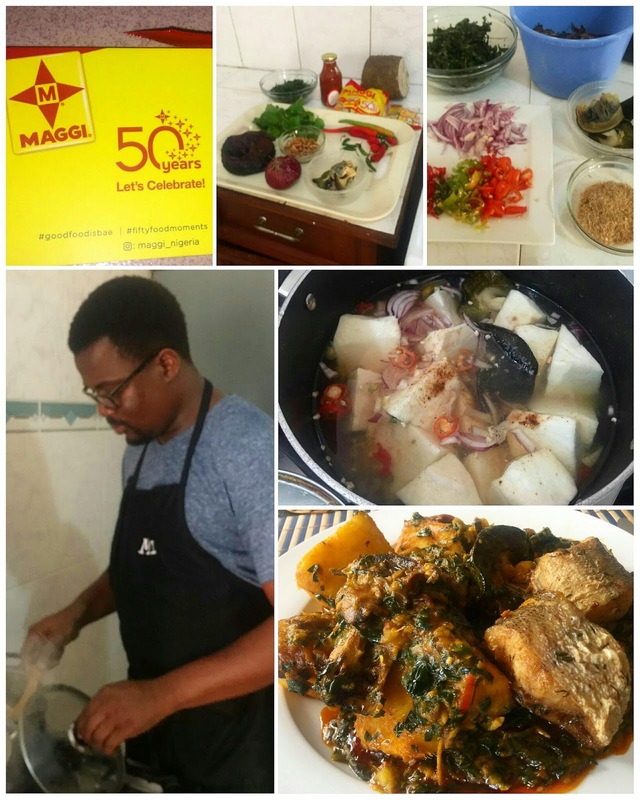 Over the weekend they delivered the package to Cakes, who made a very yummy dish of Seafood Yam Pottage today! Thank you to Maggi for your recognition. I am truly humbled and grateful. I can't thank God enough for His blessings and I really want to use my voice to give Him glory. To those who are starting out, or feeling afraid, or are just discouraged in life - Keep on. Just keep pushing. Keep believing. You don't know whether your blessing is right around the corner or who is even watching you. You will be amazed!!! Thank you everyone for supporting through the years. We know I'm not perfect and I have a lot to learn but I am thankful and very appreciative of you! God bless! Awwwwww sugar!!!! Bless the Lord! Good for you jare - you work hard and God is with you! Congratulations! Thank you so much. I'm really thrilled! Congratulations again Berry! So so proud of you. Thanks again and again Kachi!!! LOL, blame my husband for the food o. I was not there by that time. Thanks so much Stephy! I really appreciate your support. Your blog was one of the one's that inspired me to start mine and I love seeing how it's grown and evolved. Thanks Tuke. I'm glad that I was able to inspire you and see how much you've grown, and how well you've done! You too, are an inspiration. Aww this is awesome and definitely well deserved! May God keep taking you to greater heights in Jesus name! Thanks a lot Favour!! A big AMEN to that! You see why I got distracted lol. Anyway, it was a nice piece, and I do hope that Companies focus less on the super bloggers and connect with the other ones too. Some of them,like you have tons of loyal fans. 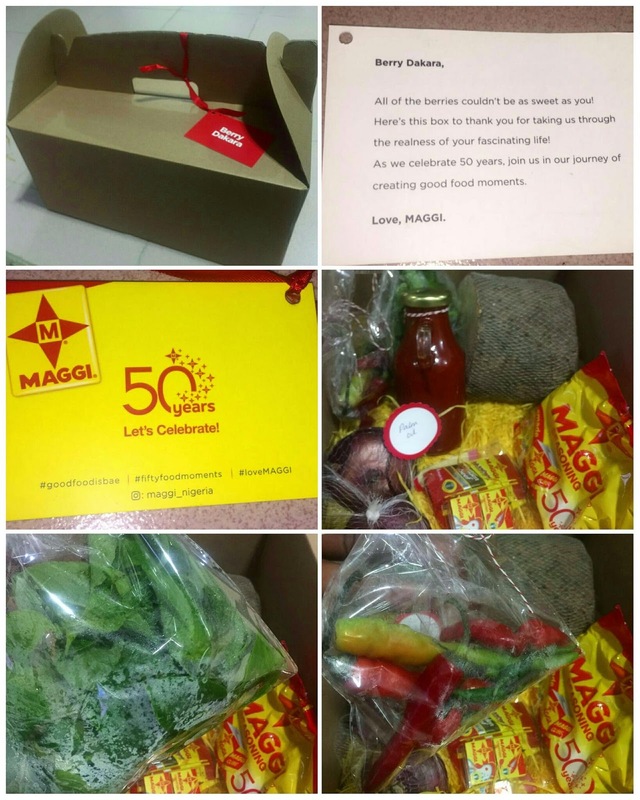 Nice of Maggi, and the accompanying note, very sweet. Lol. Cakes must be a very good cook. That dish looks amaaaaaaazing. LOL, hmm, so the links were that interesting that you forgot to comment?!?! Choi! I hope the companies and brands see o. There is quite a bit of loyalty, and also huge networking and collabs between bloggers, so I really believe that they can benefit a lot. Cakes can cook enh! Why do you think I'm always struggling with weight?! Even my mum and sister begged him to go back to Nigeria for a bit, because the temptation of cake every week was high!!!! Congrats on your many successes!! You deserve it! Thank you very much Dela!! Thank you so so so much! I know you will - just keep working at it, be consistent with your efforts and keep learning. You've been so consistent in blogging over the years. Well done. This is wonderful! Congrats Berry! Congrats Berry! I saw your ig post. I'm so happy for you! You deserve the recognition. Thanks so much Sandra!!!!!! I'm so sure it was very scrumptious. I have to step up my own game. I loved this post dear, Congratulations. You inspired a lot of people to start blogging, I sincerely admire your honest and fun approach to lifestyle blogging. That meal by Cakes is so inviting! I read the Ajebutter's guide... Hilarious! I can see that you won an award for it. That is so awesome. May God keep lifting you higher! Thank you ma'am! Cakes cooks so well enh! Thank you Tomi and AMEN! BUAHAHAHAHAHA! Would you mind waiting a few weeks, so I can get proper photographs? Congratulations!! I wish you more of God's blessings. I have been following your blog for a while, thumbs up. Now I feel like having this for dinner. All the best! Thank you very much Jamila! Hard work and consistency are very key. Aww. This is so inspiring, really. Big congratulations and many more to come. And I really needed that encouragement too. Wish you many more recognitions to come. God bless. Thank you very much Uche. I'll get Cakes to remake it when he gets back to me and I'll post the recipe and photos. Wow hun, now this what I like to see. Nigerians breaking international barriers. Congrats! The yam porridge looks so good, cakes must be a good cook. Thanks Sarah. And have you seen my weight? Is it not Mr Cakes and his food?! Ha, let me just say that I am dancing alanta because I have seen Berry's full name even though I had to click on the full HuffPo article to see it. This is where I will say that I was minding my own business when my eyes involuntarily beheld the name. BUAHAHAHAHAHAHAHAHA!!! I can't even say anything! I literally laughed out loud when I saw your comment. But shhhh, don't tell anybody. You deserve every bit of it darling Berry! Greater heights you will attain and of course more recognitions. Amen! Thank you very very much. Amen!!! Congrats. You work hard with your blog, so you deserve it. You very much deserve the recognition! Congratulations. I only just recently started reading your blog and I just kept on reading post after post in consecutive days. Your posts are entertaining and helpful at the same time. Keep up the good work dear. More grace to you. Thank you very much Ms. Mcbeal. You're very kind and I'm grinning from ear to ear. Congratulations dear Berry! You deserve it and more to come. Honestly that food Cakes made looks yummy and I wouldn't mind a plate right now but I don't want to cook it o.
LOL @ not cooking it. You deserve it all and some more. Every person longs to b appreciated when putting effort into something. You have been blogging successfully for years and I am looking up to you so one day I can say "I've been blogging for ___ years.' Congratulations, Berry.